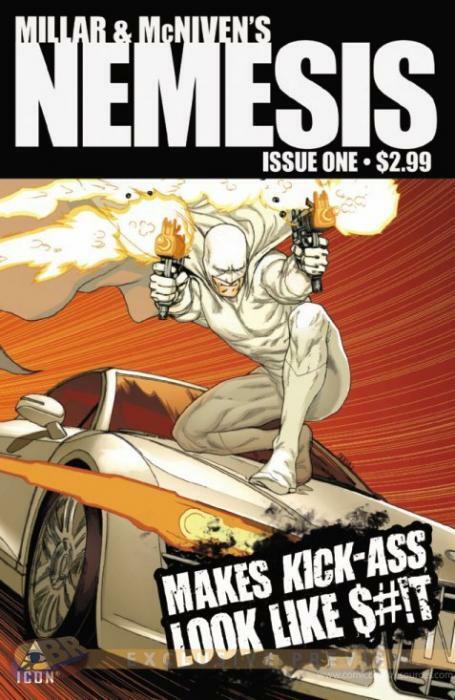 The highly anticipated Mark Millar and Steve McNiven title, Nemesis #1, came out today. This duo combined forces on the Marvel Universe splitting Civil War and futuristic Wolverine western-like adventure Old Man Logan. Both story lines were highly successful, but more importantly exploded with original content and meticulously detailed art that makes every panel worthy of a frame. Nemesis #1 is not quite there yet. Nemesis #1 begins to tell the story of a super-criminal who is terrorizing the eastern world (Japan and such) and has decided to take his brand of highly destructive and violent crime to the United States. He sets his goals high as he attempts to call his shot (as the saying goes) and bring America to it's knees. The story so far isn't amazing or even highly original. It is however, a little daring with it's amount of violence in the first issue which feels a little heavy for such a wide spread book by two stellar names in the industry. I appreciate Millar and McNiven's daring to go to that level. You can see Millar is refusing to fall into a role of simply making stories for the mainstream about mainstream characters. It is hard to see exactly where this book is going to lead but Millar has definitely earned himself at least a five issue run from my wallet. Now to McNiven... I feel bad because I certainly hyped him up in the first paragraph, but his art isn't amazing in this issue. The fact that most of the action sequences in this issue involve inanimate objects may have added to the very average performance of McNiven in Nemesis #1. Honestly, this section of the post is hard to write because McNiven may be my favorite comic artist. His Civil War covers will remain some of my favorite works of art, not just comic art, ever. But Steve, you came off as just another good artist in this book. When Leinil Yu out does you on the cover of your own book...man. Granted, Yu's work on the Ultimate Wolverine Vs. Hulk books was godly, but then again, that overall story was very entertaining thanks to Damon Lindelof. My anticipation for Nemesis #1 makes it the comic of the day, but I need to see more out of this book in the future if it hopes to reach comic of the day status once more. Yeah. The idea is what if Batman was a criminal, so they decided to show him as an opposite visually, too. But yeah, that's just an excuse for their racism.